Weekday fishing has not been a reality for me in a very long time. Whether it’s long hours of work, domestic chores or looking after a baby and a 2 1/2 year old, it just doesn’t happen. The great equalizer at the new home, is the pond in the backyard. With this convenience, I should be able to squeeze some fishing in routinely. Now, even a 15 minute window of time, can be time spent making a few casts. I decided that I would treat the pond as a place to work on my fly fishing skills, and have had fun catching Bluegill. I am confident a more proficient fly fisherman would find the pond almost unsporting at the ease of catching fish, but for me, it takes a little work and provides steady action to build confidence with the fly rod. In time, hopefully enough confidence to not take spinning gear with me on a trip that would otherwise allow either technique. The pond does have a few unique aspects that will give me some goals to aim for. The first goal would be to catch a Largemouth Bass. 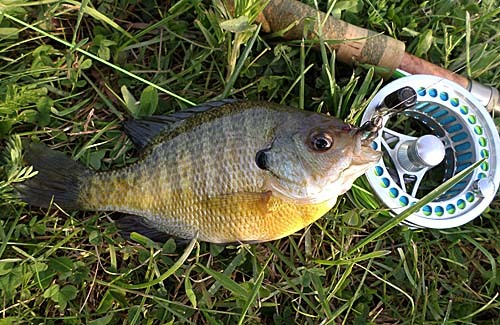 It is going to take some experimenting to find the right fly and size to induce a bass bite, over the voracious and more numerous Bluegill. The ‘holy grail’ for the pond, is coaxing one of the Grass Carp (White Amur) into taking a fly, if and when I am fortunate to have this happen, I hope it is not on the 4 wt. or I will be in trouble! I look forward to posting about the pond and my success or lack thereof fishing it.